In the second week of January, the Centers for Disease Control and Prevention (CDC) estimated that between 6 and 7 million people were already sick with the flu, and between 69,000 and 84,000 people had been hospitalized. While flu activity tends to peak between December and February, the CDC notes that activity can last through May. The news comes as no surprise to executive coaching firm Challenger, Gray & Christmas, which predicts that this flu season could cost employers $17 billion in lost productivity. Last year’s flu season was the worst since 2009, and 49 million people were sickened. If this season is anything like the 2017-18 season, employers should brace for heavy productivity losses. "The severe flu season last year left thousands of workers unable to work for up to a week as they recovered from the illness," according to Andrew Challenger, vice president at Challenger, Gray & Christmas. "These absences truly add up, especially for small and mid-size firms who likely have fewer resources to absorb that kind of loss." Challenger is predicting that up to 20 million workers might be absent for four eight-hour days as a result of this year’s flu. How did the company arrive at the $17 billion estimate? "We used the current employment-population ratio of 60.6 percent, and the average hourly wage of $27.48 to arrive at a cost of $17,587,200,000 over the course of the season," Challenger explains. "The flu is very easy to spread in a workplace environment because the influenza virus is a very prolific pathogen and very successful at infecting humans," according to Amesh A. Adalja, MD, a Senior Scholar at Johns Hopkins Center for Health Security, and a member of the Infectious Diseases of America’s Diagnostics Committee and Precision Medicine working group. "The virus is spread via the respiratory route (coughs, sneezes) and can remain on surfaces for some time," Adalja says. And workplace environments — especially offices — provide the ideal scenario for spreading the flu virus. "It is spread readily from person-to-person within enclosed spaces where people have prolonged, close face-to-face contact with each other," explains William Schaffner, MD, Professor of Preventive Medicine in the Department of Health Policy, and Professor of Medicine in the Division of Infectious Diseases at Vanderbilt University School of Medicine. The infected employers pose not one, but two problems. "It takes 48 to 72 hours for a newly-infected person to become ill," Schaffner says. But they can spread the virus to others at least 24 hours before they become ill. "Thus, the ‘dreaded spreader’ does not even know they are transmitting the virus — neither does anyone else in the workplace," Schaffner explains. The second problem is with employees who know they’re sick. "Many workplaces also suffer from presenteeism in which workers come to work despite being sick and contagious," Adalja says. Some employers may not have sick days or they may feel pressure to come to work regardless. "Also, many young, healthy workers may only get a mild case of flu," Schaffner says. "Indeed, so mild they come to work despite symptoms." And whether the flu symptoms are mild or severe, he says these individuals are contagious. "They’re spreading the flu virus to co-workers, customers, and to folks they may encounter on the bus, subway, et cetera, while traveling to and from work." So, how can you keep the flu from invading and spreading through your company? "The most important thing that employers can do to prevent flu at the workplace is to provide an annual influenza vaccine free and conveniently (for all shifts of work), along with education urging all to be vaccinated," Schaffner says. "The boss can lead by example." Adalja agrees. 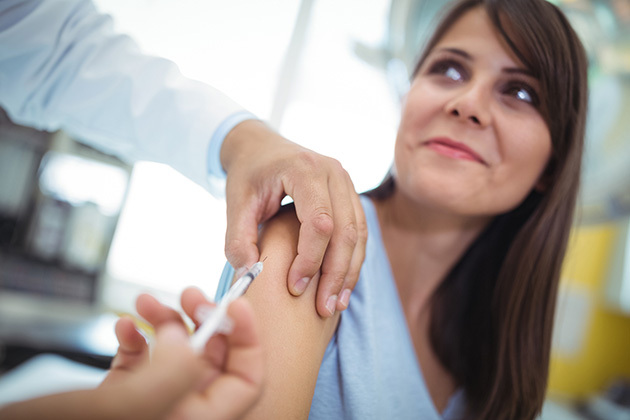 "Employers should highly encourage and possibly require the influenza vaccine for employees." And don’t underestimate the importance of making the vaccine convenient and free. "Employers can have vaccinators come to the workplace in order to make flu vaccination easily accessible,” he says. “It may even make economic sense to employers to pay for the flu vaccination as it will diminish absenteeism during flu season." Also, encourage workers to wash their hands on a regular basis. "Employers could have hand hygiene stations during the flu season as well," Adalja says. This may also be the time to relax some of your traditions and standards. For example, Challenger recommends that you limit your meetings, if possible, since gathering large groups of employees in a confined space will help to spread — not limit — the flu. If you have to meet, do it via conference calls or video conferences. He also advises against handshakes until flu season is over. "Also, keep a supply of disinfecting spray and encourage employees to disinfect phones, computers, and other workplace surfaces on a regular basis," Challenger says. Door knobs, elevator buttons, water fountains, and faucet handles, and refrigerator handles are other places where workplace germs can lurk. In addition, the CDC recommends encouraging your workers to cover their nose and mouth with a tissue when they sneeze or cough (which should be promptly thrown away) and then washing their hands. Tissues are more sanitary than handkerchiefs because people don’t dispose of the latter. Both Adalja and Schaffner stress the importance of letting sick employees stay at home, and both recommend having an actual policy so they can take sick leave without penalty. Terri is a journalist/copywriter working with such brands as The Economist, Yahoo, USA Today, Realtor.com, US News & World Report, The Houston Chronicle, and Loyola University Chicago’s Center for Digital Ethics and Policy. You can keep up with her latest adventures @Territoryone.